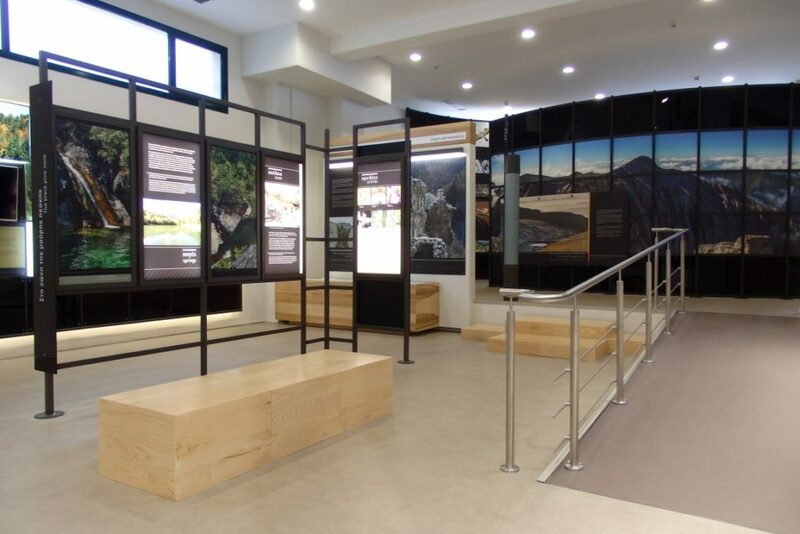 Olympus National Park Information Center is dedicated to the natural richness and multifaceted uniqueness of the most emblematic mountain of Greece, Mount Olympus, inviting the visitor to take a virtual ascent of Mount Olympus, from the foothills of the mountain to the highest peaks. 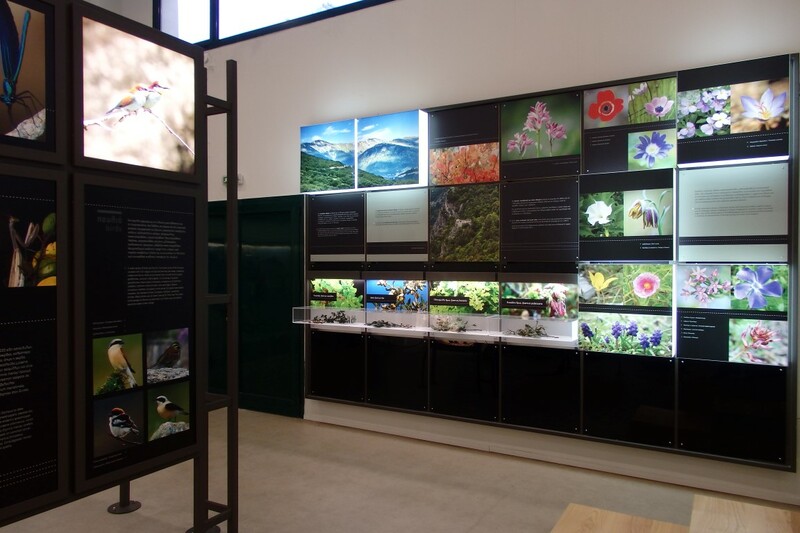 The Information Center is located in Litochoro (Prefecture of Pieria, Greece), together with the offices of Olympus National Park Management Agency. 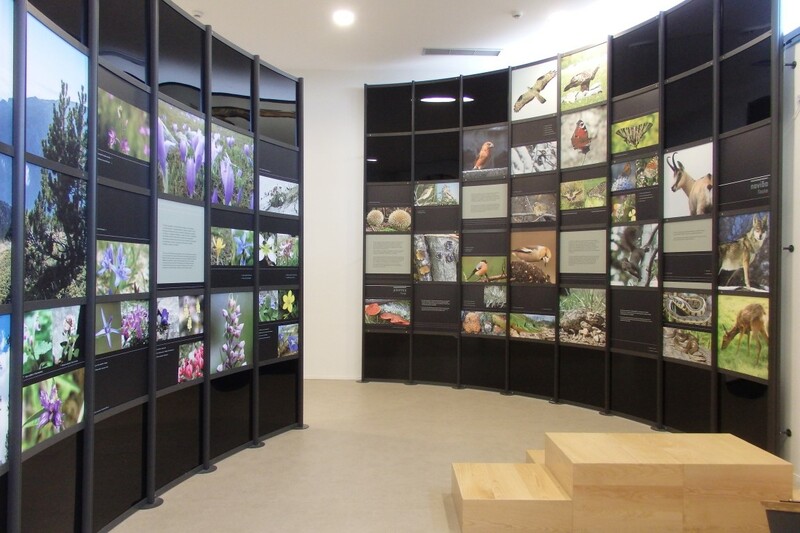 The exhibition was put together at the end of 2015, was commissioned by the Goulandris Natural History Museum/Greek Biotope – Wetland Centre, and financed by the NSRF. 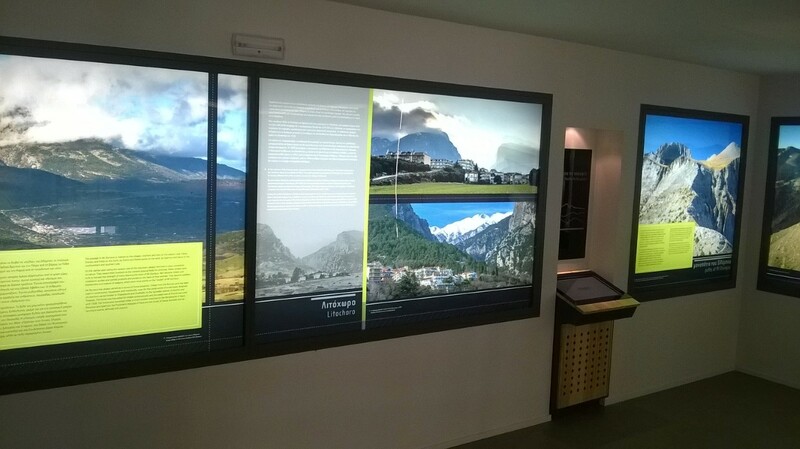 The exhibition is set out on several levels of the Information Center, and includes easy to comprehend information, striking images, static exhibits, illumination boxes, films, multimedia applications, and a three-dimensional projection, to display the multi-faceted Olympus environment at different altitude zones. The virtual ascent to Olympus is completed in seven thematic sections. 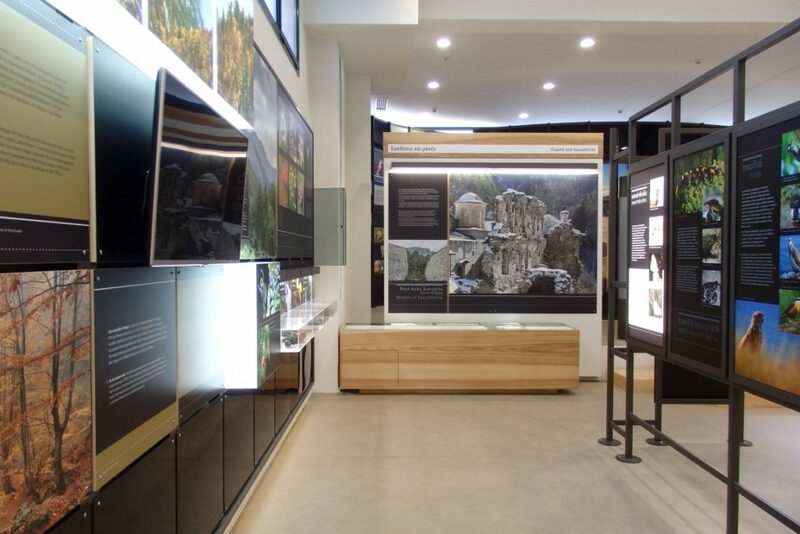 The first one is the Introductory section, describes the geological history of Olympus and highlights its multidimensional importance through brief texts and impressive 3-D graphics. The Olympus section follows. From the foothills to the highest peaks it provides information on the human settlements, which are also the gateways to the mountain, on the paths and routes that lead to the peaks and the visible and invisible changes that show the transition from one elevation zone to the next. The climb starts in the foothills of Olympus, in the section that deals with nature and evidence of human civilization, at an altitude of 300-500 meters. 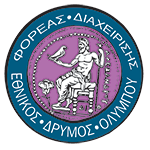 The theme focuses on Mediterranean vegetation, animals moving at low altitudes, rocks and geomorphology, climate, and also on the archaeological sites found around the foothills of Mount Olympus. 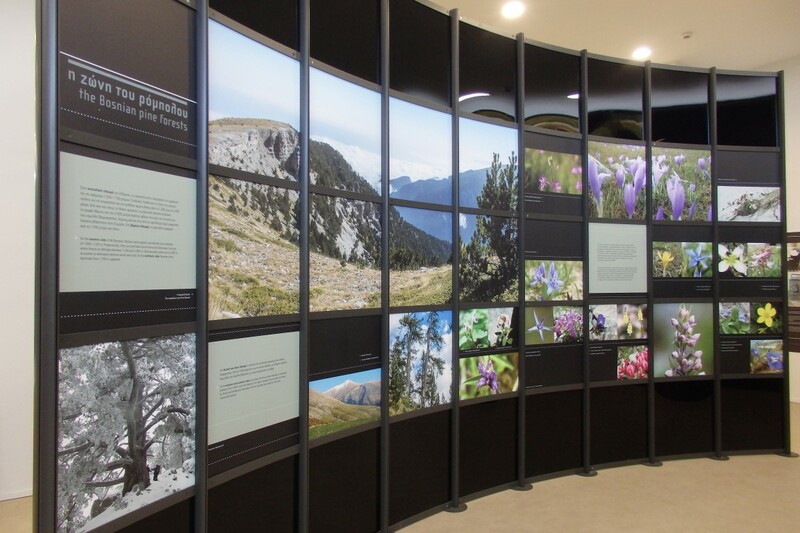 The next thematic section, in the Intermediate mountainous zone, describes the mountain environment from 500 to 1400 meters, looking at the black pine zone, the plants and animals that choose its ecosystems, the springs and caves of Olympus, and the historic monasteries that were built on the slopes and are an important part of the history of Mount Olympus. The previous two thematic units also include a section on the Enipeas gorge. This is located on the rising ramp from one level to another, and highlights the particular richness of the most famous gorge of Olympus. The ascent continues in the boreal forest zone, which is dominated by Bosnian pine. Information on the geomorphology and the environmental conditions in this zone and the chasms and caves and the plants and animals, are also relevant to the high altitudes of Olympus, from 1400 to 2500 meters. 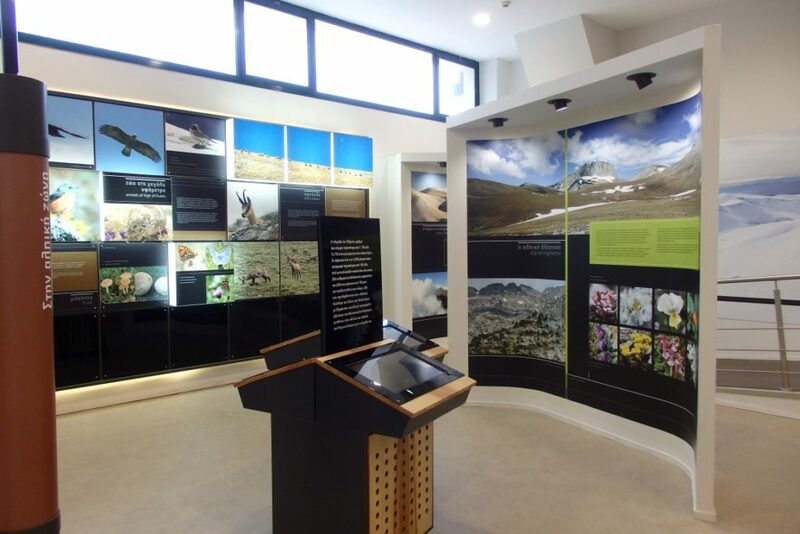 In the alpine zone section, the exhibition describes the conditions which predominate from 2500 meters and above, and focuses on animals at high altitudes, including the Balkan chamois. It also looks at the alpine vegetation of the zone, and focuses on wild flowers that make Mount Olympus famous for its flora. In the same section information on the mountain peaks, the first attempts at measuring the mountain’s height in ancient times, and the timeless efforts of people to reach the mythical peaks, is provided. The ascent ends on the mythical peaks, which is also the highest level of the exhibition space. The first official ascent to Mytikas in 1913, followed by landmark events, make up the mountaineering history of Olympus. At the top level, there is also a display looking at a modern history of the people of Mount Olympus and the history of the gods of ancient Greece. The mythical battles for the conquest of Olympus, the significance of the twelve gods – and the sovereignty of Zeus, snapshots of his life and his action, are used to highlight the reasons that made Olympus an emblematic symbol of Greek civilization.